The Executive model is ideal for an office environment. 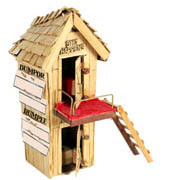 Each Executive Outhouse is made by experienced craftsmen in America. The Outrage House Company is taking orders for this unique piece. By clicking the link below you will be placed on a waiting list. There will be no charge or deposit. When one thousand orders are received we will begin producing these hand-crafted masterpieces. Email us to reserve your piece of Americana at the guaranteed price of only $150. When they are ready to ship, you will receive an e-mail with a link to place your order. Pre-Order the Executive Model here.